Students don’t tend to go to college with a start-to-finish track in mind. It seems hard enough to simply get to campus in the first place, what with finals, graduation, SAT/ACTs, FAFSAs, college selection, and admissions taking up all of a high school senior’s mental shelf space. Upon arrival, battered and excited students will then make their various financial and course selection decisions turn-by-turn as they come up. It’s not surprising they often then fail to see the big picture and suffer a fate akin to “death by GPS” wherein all seems on track but one has no clue where one is at in the scheme of things. One of the particular dangers of school loans is that they get taken out over time, semester-by-semester, instead of in one bit shot in an amount to cover the total educational experience. Further, many students acquire their debt from several different sources- federal and private, subsidized and unsubsidized. Students surveyed for studies such as this one, therefore, must not remember the amount of a singular loan they took out, but the sum total of all the various loans they have accumulated over time. College officials like to lump the various scholarships, grants, work study programs, and loans providing the student funding under the umbrella of “financial aid.” This confuses students, for whom the word “aid” means “help from others“, while with loans in the mix some of this aid involves a lien on one’s own resources. 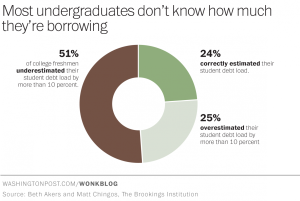 Whatever the reasons, it should trouble us that the majority of students do not know how much debt they have taken on and that a good chunk of said students have no idea they’ve taken on any. In response to this trend, affordology-minded students and their advisors need to map out their college plans and expenses from start to finish before they start, keep track of the sum total of debt enrollment as it’s incurred (a simple spreadsheet will do), and ask very specific questions about the nature of one’s financial aid before signing any dotted lines.